Meet... The Avengers. Four pages. Dave Rogers. Brief biographies of Steed, Mrs. Gale, Mrs. Peel and Ms. King. 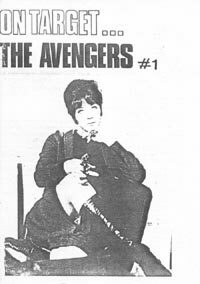 The Avengers (Hendry / Macnee 1961). Two Pages. Dave Rogers. Episode titles, broadcast dates, writers and directors for Season One. The Avengers. Dave Rogers. One page. Short facts and figures round-up. Curry A La Carte. Two pages. Stephen and Joy Curry. Regular information on the current activities of various Avengers luminaries.